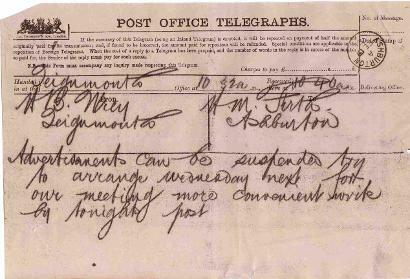 Left: A telegram from 1881, sent from Teignmouth at 10.32am and received at Ashburton at 10.40am. They were charged by the word, but this doesn't seem to have particularly worried H B Wrey, who sent the message. He also failed to use perhaps the best known part of any telegraph message - the word 'stop' to indicate a full stop. In the 1830s, the new railways faced a problem of efficiency and safety - they had no way of telling where trains were. Charles Wheatstone and William Cooke in Britain developed systems of sending messages by wire, using electromagnetism to move compass needles - these pointed to letters on a grid. In the United States Samuel Morse in collaboration with others developed a code of short and long pulses, and it was this that turned electrical telegraphy into a global phenomenon. In 1839 the Great Western Railway formally started to use the electrical telegraph. The first general telegraph service was available in 1845, and by the 1850s the messages were commonly called 'Telegrams'. In 1868 a parliamentary bill transferred the electric telegraph to the Postmaster General. In 1981 telegrams became part of British Telecom, which discontinuted them in 2003. Some private companies still provide a service. In the 1911 census William Henry Edgecome's 25 year old daughter, Alice, is the telegraphist. 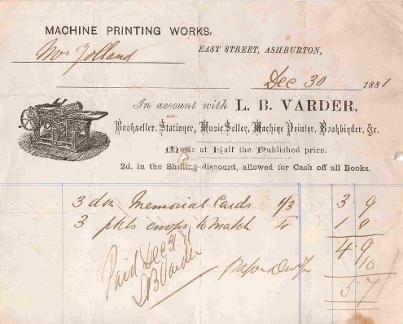 L B Varder (Lavington B Varder according to the 1891 census http://www.freecen.org.uk) published Charles Worthy's book Ashburton and Its Neighbourhood in 1875. There was a sad end to Mr Varder's life: in 1894 at an inquest at the Golden Lion Hotel it was stated that he committed suicide by cutting his throat. Left: A cheque drawn on the Ashburton Bank of Messrs Watts, Whidborne and Co., which was backed by the London bank of Messrs Williams, Deacon and Co. It is 19½cm x 8cm (7½ x just over 3 inches), and is dated November 3rd 1882. It is for £2 4s 6d and is payable to C W Chute Esq. The signature looks like H W Firth. In 1862 the Western Times announced that Messrs Watts, Whidborne and Moir had opened a branch at Ashburton - 'an agreeable announcement to this ancient borough'. From Morris and Co's Commercial Directory and Gazetteer 1870: Watts, Whidborne and Co., bankers, West Street (branch of) draw on Williams, Deacon and Co., London. Manager - William Creber. Following the death of Mr Whidborne and because of the age of the senior partner, in 1891 the four businesses (Dawlish, Teignmouth, Ashburton and Newton Abbot) were transferred to the Capital and Counties Bank Ltd.
Left: Mourning stationery, 1882. 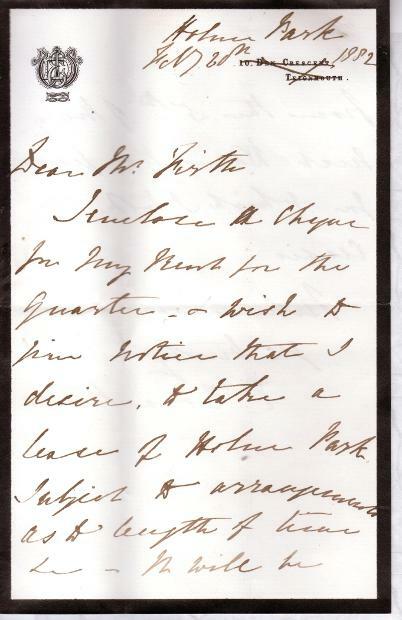 This is a letter from Elizabeth Dorothea Wrey, widow of the Rev John Wrey, to Mr Firth (a solicitor). Her husband died in October 1872, and his address was 10, Den Crescent, Teignmouth (North Devon Journal 24 October 1872 p8 col6). It seems likely that Mrs Wrey had the black-edged stationery printed at that time, complete with her own monogram. 10 years later she is living at Holne Park, and has crossed out the Teignmouth address. The letter concerns her wish to continue leasing Holne Park. amongst others). In this case either another family member has died, or Mrs Wrey is being economical, and is using up stationery that she already has. 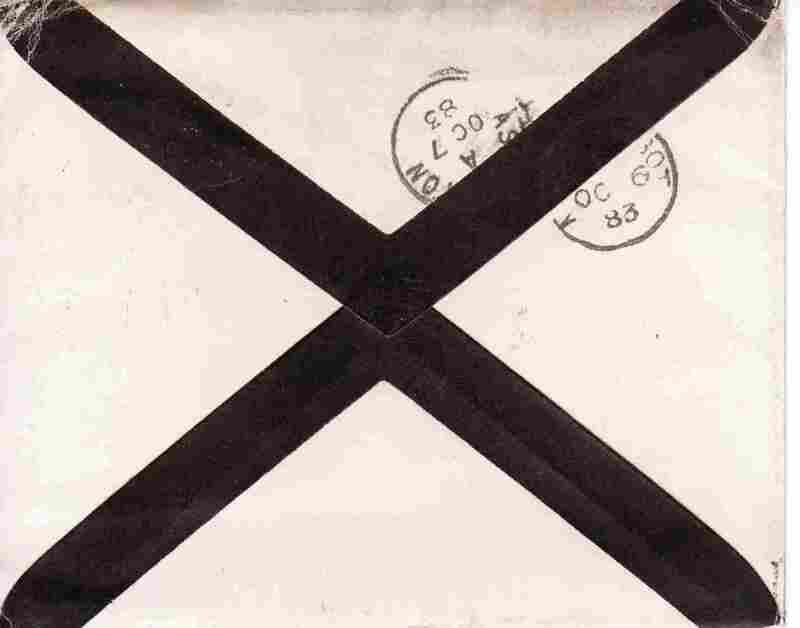 Above, and above right: More examples of mourning stationery. 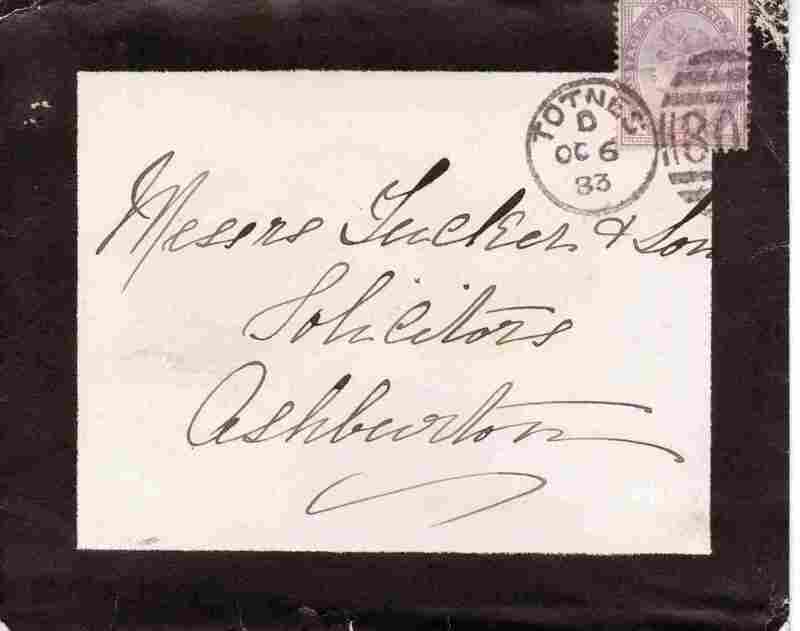 This envelope, sent to solicitors Messrs Tucker and son, was stamped in Totnes in October 1883. Right: A receipt from J Clymo, 'Silk mercder and woollen draper, hatter, hosier, haberdasher etc. 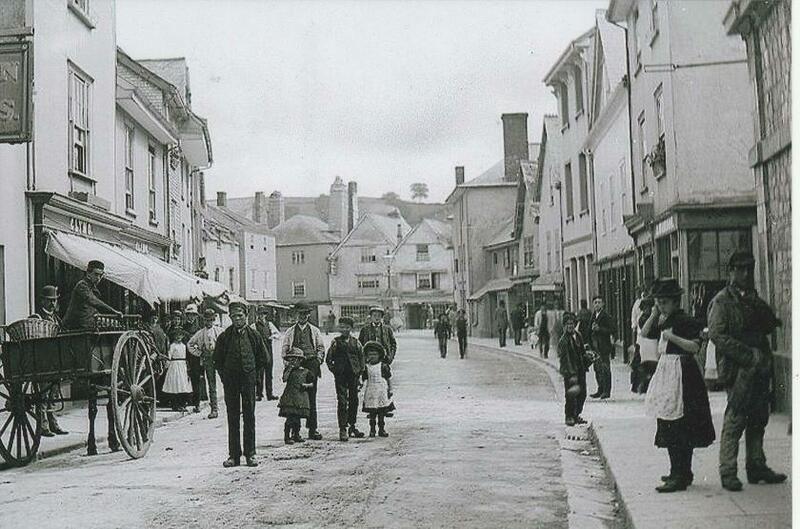 ', of Market Place, Ashburton. The logo on the left hand side says 'Family mourning', and as well as advertising that funerals are 'furnished', we are told that there is a millinery warehouse, and that dresses and mantles are made to order. 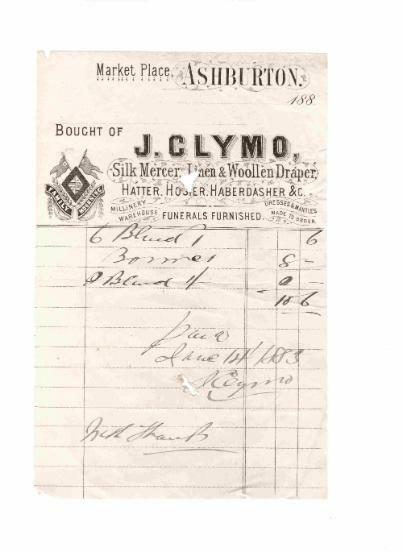 It is difficult to read what Mr Clymo supplied in 1883 (it looks like the bill was paid on June 14th), but the second item looks like 'bonnet' for 8s. The 1881 census has a James Clymo, aged 29, a draper employing 4 hands, living in North Street. He has a wife Sarah M and 4 year old child Margaret N E. Both Sarah and Margaret were born in Ashburton, but James was born in Australia. Above: North Street. 'Clymo' can be seen written on the shop on the left hand side. This is the same James Clymo who later became the landlord of the Golden Lion. Kelly's Directory of Devonshire 1902, p32: Golden Lion Family and Commercial hotel and posting house (James Clymo, proprietor) East St.
Mr Chalk's shop was in East St., at the corner of Station Road. 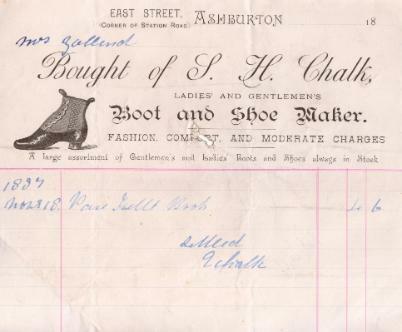 In the 1891 census Samuel H Chalk is a shoemaker in East St. - aged 59, he was born in Ashburton. At this time his 17 year old daughter Flora R Chalk is a shoemaker assistant. 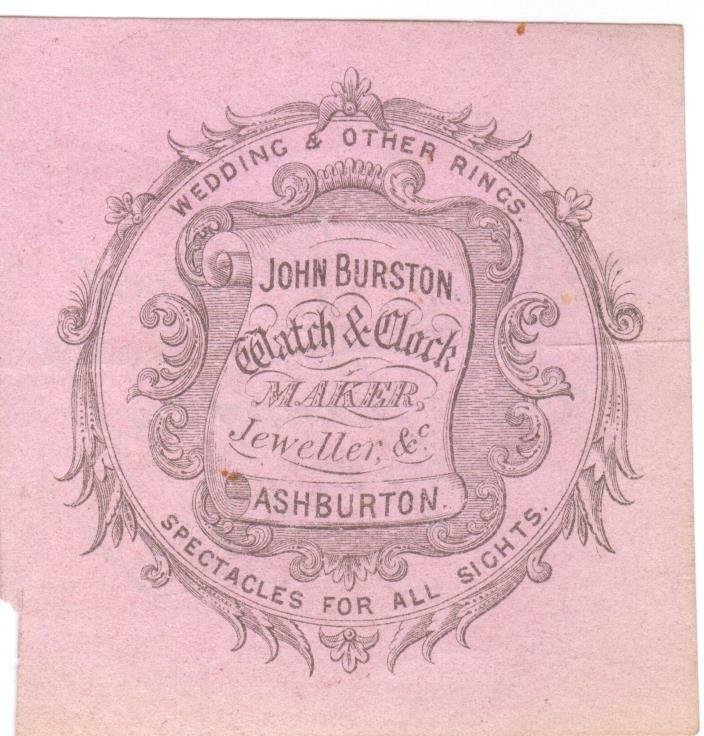 Right: A tiny ticket, 6 x 6cm, from John Burston, watch and clock maker and jeweller. Mr Burston also sold 'Spectacles for all sights'. The ticket, dated September 21st 1887, is for a new mainspring for a gold Geneve watch - probably the customer, in this case Mrs G Yolland, was given the ticket as proof that the watch was in Mr Burston's possession. According to the website of the Federation of the Swiss Watch industry, http://www.fhs.ch/en/* the term Geneve means that the timepiece is made in the canton of Geneve and is of the highest quality. In the 1881 census John Burston is shown in East Street, but by 1891 was in St Lawrence Lane. By 1902 J Burston is operating from 71a Queen Street, Newton Abbot, advertising that he has been there for 7½ years, after being at Ashburton for 18. He also says that orders can be taken at 3 Fore Street, Teignmouth. Left: A receipt for items provided by Charles Skinner, 'Linen and woollen draper, silk mercer, hosier, glover and haberdasher', of East Street. Sent on February 18th, 1888, to the executors of the late Mrs G Yolland, it was settled in April. Mr Skinner provided: 6 bearers' gloves at 2/9d each, 1 kid glove for Dr Gervis, I cap (2/6d) and 1 tie (1/6d) for 'Nurse' and 2 pairs gents best Dents (?) gloves at 6/6d each. Mrs G Yolland was probably Mary Ann Yolland, widow of Mr Geo. Wills Yolland - she died on February 9th, 1888.